Awesome Friday! » Blog Archive Review: 'Ant-Man & The Wasp' delivers big with small stakes - Awesome Friday! The story picks up two years after the events of Captain America: Civil War. Scott Lang (Paul Rudd) is nearing the end of a two-year house arrest sentence (which, given the nature of his international border crossing, internationally ratified treaty breaking, massive property damage causing crime seems maybe a bit short?). 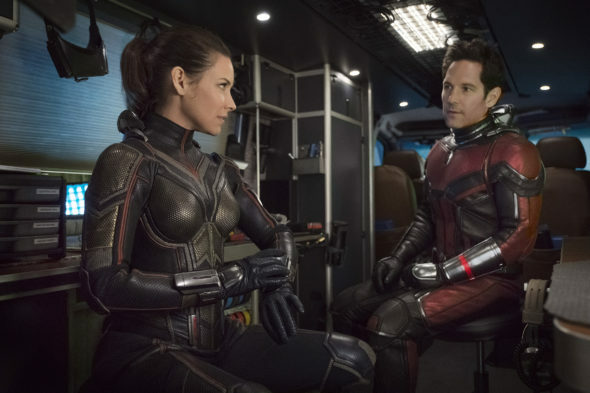 Hank and Hope Pym (Michael Douglas and Evangeline Lilly, respectively) have now been on the run for two years though because in providing Scott the Ant-Man suit they have become accessories. Events conspire to bring our heroes back together though as Hank believes it may be possible to save his wife, lost for the 30 years in the Quantum Realm, since Scott successfully entered and returned from it in the last movie. Once the ball gets rolling it basically becomes a chase film as the heroes have to navigate threats from the law, a group of black market arms dealers led by Walton Goggins, and a mysterious new villain called Ghost who is mixed up with all the quantum stuff and can phase through matter. The action on this chase is mostly great. There’s a car chase scene that might actually be one of the best and funniest things that Marvel has done to date. The effects are pretty next level too. It sounds strange to say that maybe but after a film like Avengers: Infinity War the CGI seems less obvious in this one even when cars are shrinking and growing before you eyes. It’s not a flawless film though, there are a few arbitrary deadlines that felt a little clunky to me, and there’s a big exposition dump in the middle that derailed everything for more than a few minutes. This movie also introduces comic book character, tells us their back story, and then doesn’t actually deliver anything on it. I can’t really say more about that without spoilers, and I know that you might think they can just pay it off in future movies, but you can’t just pay everything off in future movies. That said, the film is still delightful. Evangeline Lilly and Paul Rudd both deliver and their chemistry feels a lot more real this time around, Michael Douglas continues being the grumpy old man to great effect, and of the various competing stakes in the movie the important one –Scott Lang not getting found out by the feds and getting sent to prison– gets the most focus. So is it better than the last one? Honestly, no, it isn’t. But it isn’t worse either. They’re both fun, lighthearted stories with small personal stakes, some fun performances and moments of hilarity. I hold this movie in equal esteem to the last one and, in all honesty, it’s such a nice palate cleanse after I kind of hope we get an Ant-Man & The Wasp movie after every Avengers movie now.